The Three Moving Average system attempts to identify ranging markets which are then avoided as they tend to be unprofitable when traded with trend indicators. fast moving average is above middle moving average. 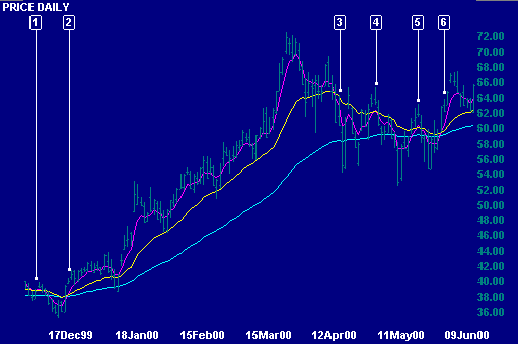 Close long when fast moving average crosses to below middle moving average from above. fast moving average is below middle moving average. Close short when fast moving average crosses to above middle moving average from below. Intel Corporation chart with 5 day (fast), 21 day (middle), and 63 day (slow) exponential moving averages. Close previous long trade as the fast moving average has fallen below the middle moving average. Go long as the middle moving average has risen above the slow moving average (and the fast moving average above the middle moving average). Close long trade - fast moving average has fallen below middle moving average. We are whipsawed in and out of a long position as the fast moving average crosses to above then back under the middle moving average. Go long as the fast moving average crosses to above the middle moving average (and the middle moving average is above the slow moving average). Whipsaws are not entirely eliminated. Using trailing stops to time entry and exit points may further reduce unprofitable trades.